You can create unlimited number of widget areas. By default, there are only 2: default sidebar and footer. To add custom widget area, in the right side of the page (fig. 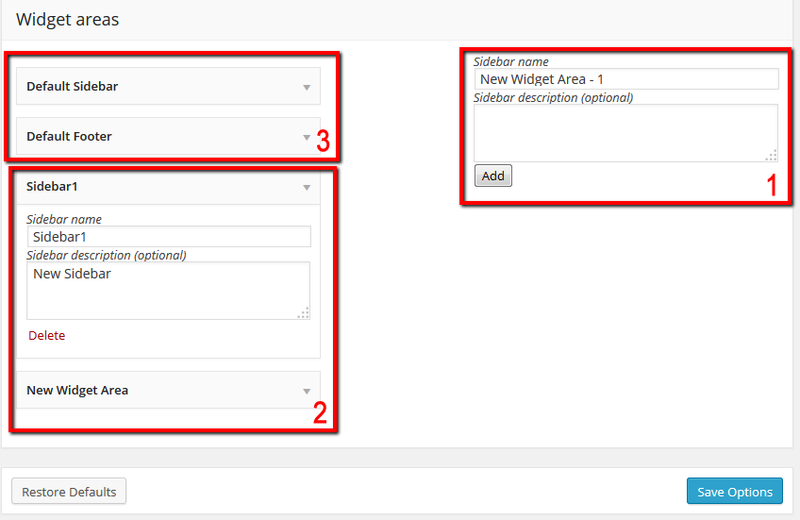 1, section 1) fill sidebar name and description (optional) fields and hit the “add” button. Your new widget will appear in the widget area list in the left side of the page (fig. 1, section 2). Widget areas can be ordered by dragging them with your mouse. You can remove custom widget area by clicking the “delete” link inside the correspondent widget area (fig. 1, section 2). Fig. 1. Widget area management. Changes you are making on this page will affect standard widgets management page “WP-admin > Appearance > Widgets”. You can learn more how to use custom widget areas here.